If you can imagine an aircraft carrier steaming along at roughly 30 knots and then shrink all that energy down into two subatomic protons then this may give you an idea of the enormous collision energies that occur at the Large Hadron Collider. Our speaker, Dr Sinead Farrington from Warwick University, used this analogy when she came to talk to us about "The Search for the Higgs Boson" and how her research would help to reveal this elusive particle. The actual physics experiment called the Large Hadron Collider (or LHC) is not housed in some small laboratory room – it is enormous. It is a 27km-long underground ring sitting 50-175m below the surface and crosses the French-Swiss border. Dr Farrington compared it to the London Underground's Circle Line but somewhat deeper. It is called the Large Hadron Collider as it is very large, protons are a type of particle known as hadrons and a collider is a type of particle physics experiment. The LHC is a unique piece of equipment built solely to investigate the world of subatomic particles. Just as an athlete slowly builds up their speed as they train so the LHC gradually increases the speed of the particles that are sent around the underground circuit. Higher speeds relate to a particle having a higher energy and so when these collide more energy is released in the collision. At these higher energies more exotic types of particle are created as the protons, which can be travelling at near the speed of light, effectively turn into energy and then this energy reverts back into other subatomic particles that can be studied. This mass-energy equivalence was proposed by Albert Einstein and described by the famous equation E=mc². 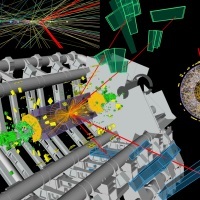 Interestingly, the ephemeral Higgs boson particle cannot be seen directly by the LHC particle detectors but is surmised to exist from the particles produced when it turns into a shower of other particles. The experiment that Dr Farrington works on is called the ATLAS detector and like most things to do with the LHC it is huge; being comparable in size to the dome of St Paul's Cathedral in London. At its centre is the relatively small tube through which the protons are guided. It is surrounded by concentric shells of detectors that record the passage of different types of particles produced by the proton-proton collisions. After millions upon millions of collisions the scientists working on ATLAS have found what they think are the particles produced when a Higgs boson changes into more stable particles. These particular set of particles are predicted by the scientific set of particles called the Standard Model. In contrast to the acclaim in the media of the Higgs boson discovery, scientists actually involved in the new results are somewhat more reserved in their pronouncements. They quote statistical probabilities that this particle is the long sought after boson but tend to report that much more data is needed to confirm its identity within the Standard Model. Presently the LHC is not running as it is being upgraded so that the particles can be given even more energy. It will restart its experiments in 2015 when higher energies could produce even more bizarre particles from the resulting particle soup of collisions.